All America Selection Winner with nearly stemless stalks. The Kale Kult is ever-expanding with a wave of konverts across the U.S.A. ‘Prizm’ is a superstar new kale variety. With densely packed plants loaded up with short, tightly-ruffled, deep-green leaves with nearly stemless stalks. 2016 AAS winner ‘Prizm’s sumptuous green plants provide a visual and flavorful treat on the patio, putting delicious nutrition within arm’s reach. Some salad with your patio? Delectably luscious leaves—the younger the sweeter—offer rich, gently nutty flavor, perfect for salads, soups, and your favorite cooked dishes. Please enter your email address below and we will notify you when this product is back in stock. Planted in Spring or for Fall these fun favorites are packed with nutrition and are very easy to grow. Learn how to plant and grow kale from Burpee's expert horticulturist. 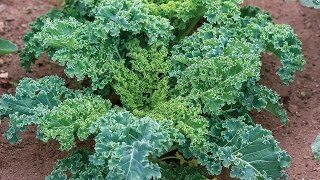 Kale may be direct sown for a spring and fall crop, or purchased as transplants for a fall crop. 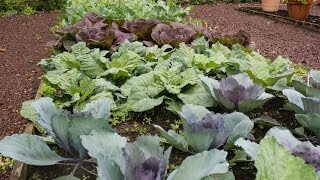 Sow in full sun in early spring and in midsummer for fall crop. In the Deep South, gulf, and pacific coast areas, sow from fall to early spring. Plant seeds evenly and thinly and cover with ¼ inch of soil. Firm lightly and water gently. Seedlings emerge in 10-21 days. Kale prefers rich, well-drained soil, and can tolerate some shade. Avoid areas where any member of the cabbage family grew the year before. Dig a hole for each plant large enough to amply accommodate the root ball. Space plants 1 – 1½ feet apart in rows 2 feet apart. Carefully remove the plant from its pot and gently loosen the root ball with your hands to encourage good root development. Keep weeds under control during the growing season. Weeds compete with plants for water, space and nutrients, so control them by either cultivating often or use a mulch to prevent their seeds from germinating. Avoid disturbing the soil around the plants when weeding. Keep plants well watered during dry periods to promote rapid, uninterrupted growth. Monitor for pests and diseases. Check with your local Cooperative Extension Service for pest controls recommended for your area. While small, floating row covers will help to keep pests at bay. Harvest kale after first frost if you prefer a sweeter flavor. Pick the outer leaves as needed once they reach 6-8 inches long about 55-60 days after transplanting. Leave the central bud since it will grow new leaves. Store kale in an airtight bag in the refrigerator for 5-7 days. Wash when ready to use. Use kale as a substitute for lettuce, cooked cabbage and collards. Kale, Prizm Hybrid is rated 4.3 out of 5 by 8. Rated 1 out of 5 by misskim0519 from Product was disappointing! I bought this kale for my parents garden. They have raised kale for many years. The plants are beautiful! But the taste is bitter and the leaves are tough. They have tried it several times throughout the growing season....always with the same results. Not tasty at all! The old timers say that after a frost 'greens' will be more tender and sweeter....not so with this variety. Will not be purchasing these again. Reading others reviews, I am disappointed that it was not the same for my parents. Rated 5 out of 5 by NickDigi from beautiful kale plated this month in a raised garden and the kale is now up and growing beautiful. Rated 5 out of 5 by Galonzo from Attractive and tasty Started from seed. It did extremely well. Right next to Lacinato kale and it is basically insect free while the Lacinato leaves are eaten. Great side benefit! Rated 5 out of 5 by Sting from Great taste Grew in container and on ground . Taste was great ,abundance of leaves. Container growing was especially impressive . Used in stir fry and salads. Will buy again next year. Rated 5 out of 5 by Lynnie from Great tasting I have recently fallen for kale and this one grew quickly, and is very hardy, even with the hot weather we've had this year. Rated 3 out of 5 by lgaE from Ok First planting did not germinate. Second came up fine. The other kale (sea kale) did not come up either planting. Rated 5 out of 5 by luvs2garden from Prizm Kale First time growing kale. Was reluctant as I didn't like kale but now I know I didn't like kale from grocery stores. This kale is terrific - not bitter or sharp tasting, beautiful as well as great flavor! Will make it a regular crop going forward.